Municipal elections happen every four years. In Whistler, there is one Mayor and 6 Councillors. 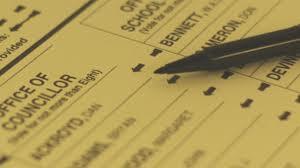 Voters elect the positions by completing the ballot with up to six votes. Voters choose whether they want to pick just one candidate that they really believe in, or as many as they think are great for the job. It is not a ranking, so pick all of the people that you want, but don’t feel obliged to pick 6. Your vote counts. Whistler has 10,000 residents, many of whom are not Canadian. We have a little more than 7,000 eligible voters, and generally a 30% -50% voter turnout. If you and 3 friends show up to vote, your say can have a serious impact!